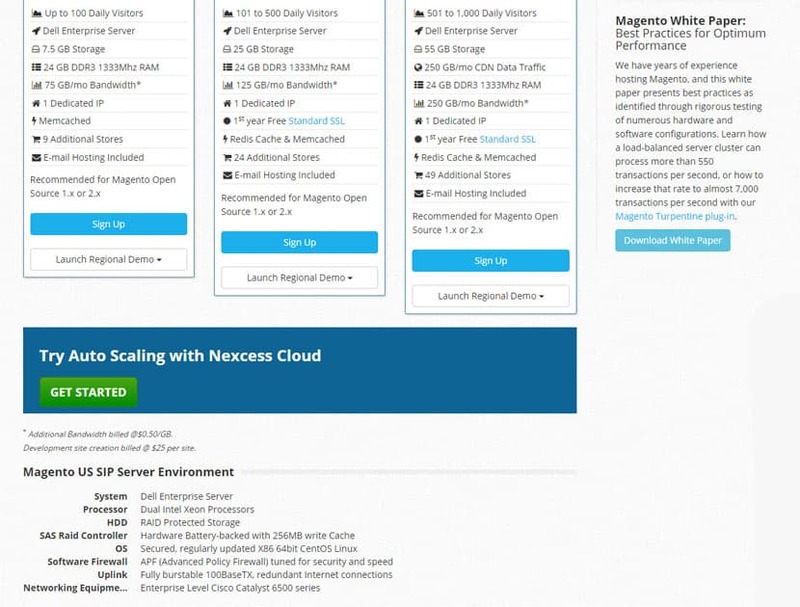 Nexcess Review 2019: Is Nexcess a Good Hosting? Nexcess is an amazingly feature-rich web hosting provider especially optimized for a select few CMSes including Magento and WordPress. Their auto-scaling Nexcess Cloud platform is their best feature. Nexcess is an amazingly feature-rich web hosting provider specially optimized for a select few CMSes, including Magento and WordPress. In business since 2000, they operate five data centers across the United States, the United Kingdom, and Australia. Nexcess promises superior loading speeds and server performance, particularly for Magento or WordPress websites. They boast that they’re up to 13x faster than standard web hosting services – which, according to my tests, is a fairly accurate claim. They accomplish this by utilizing SSDs and RAID for their cloud storage, along with Apache 2.4, MySQL 5.7, and PHP 7.0/7.1. This power-packed trio offers much lower memory consumption, better load balancing, improved security, and greater performance gains. One unique feature Nexcess offers is their auto-scaling platform for Nexcess Cloud. This means that even if your website experiences a surge in traffic or e-commerce transactions, the server’s resources will be automatically scaled up to handle up to double the increased load – thereby ensuring optimal speeds for your visitors even during crunch times. Upgrading to the M Shared Nexcess Cloud plan bumps this number up to 75 concurrent users (100 with auto-scaling), 125GB disk space, and 3TB bandwidth. The highest level provides for 150 concurrent users (175 with auto-scaling), has 800GB disk space, a whopping 10TB bandwidth, 32 vCPU, and 32GB RAM. Of course, you receive free SSL certification with all of these plans, and you always have the option of upgrading to an Extended Validation (EV) SSL Certificate for the highest level of encryption. When you’re setting up your account, you can select from a few available CMSes, which will be installed for you automatically. These include Magento, WordPress, WooCommerce, ExpressionEngine, CraftCMS, and OroCRM. All Nexcess users have access to the Nexcess Client Portal, which allows you to control everything about your hosting account via a single login. You can change your resource allocations, pay your bills, track your visitor analytics, and much more with this rich user interface. Nexcess also provides free website migrations, and you can be assured that your website will experience little to no downtime during the transition. They even take care of backups automatically, creating them off-site every day and storing them for up to 30 days. If you’re comparing Nexcess to other cloud hosting services, Nexcess definitely isn’t the most affordable. The trade-off is that many other cheaper cloud hosting services don’t include the 24/7 tech support, auto-scaling, daily backups, website acceleration, and caching that Nexcess features. Their auto-scaling feature allows you to have double the number of visitors on your website for up to 12 hours without any additional charges. After that, you can either pay by the hour or upgrade your service to the next tier up. This is a huge advantage compared to the pay-as-you-go model that many other cloud hosting providers adopt: you won’t be punished if your website does well. In fact, you won’t even have to pay, if that spike in performance is temporary. Upgrades and downgrades are a breeze with the Nexcess Client Portal: you can even jump from shared to dedicated hosting platforms instantly. There’s no free trial or free plan available, but that’s understandable considering the level of service they offer. Nexcess takes a proactive approach to customer support. Rather than leaving you to contact them when issues occur, they believe in constantly monitoring your websites and servers and eliminating problems before they occur. However, in the rare event that issues do come up, their support representatives are available 24/7/365 via phone, email, support tickets, and live chat. Do note that you’ll only be able to reach tech support after logging into your client portal – the live chat on their main website is primarily for pre-sales questions. onClick="trackClickout('event', 'clickout', 'Vendor Page - Visit User Reviews', 'Nexcess', this, true);"
R J. (. o. o. f. o. b. s.
Nexcess pushes the envelope in developing new solutions, such as their latest cloud offering, but unfortunately does not have the experience, or perhaps funding, to back it up. We launched a simple Magneto instance on their most robust cloud offering only to have illogical technical limitations (like inability to vary permissions at file level by user) force us to open another, standard, hosting agreement as a workaround. Then, when things broke (as they started to, frequently), our tech team had to lead their to solutions, often after hours of downtime.They are probably a great host for standard or basic clients, but we had a very bad experience when we started to trust them beyond that. Ultimately we are glad we moved away as we achieved a much more robust solution for about 1/2 the cost, all said and done. I think you should try Cloudways and write something about them. I am using their services for a long time and happy with the platform. I am using their Magento hosting service because my store was not performing well when I was using shared hosting. If you’re looking for a specialized Magento or WordPress host, you won’t go wrong with Nexcess. However, they’re best for mid-range websites or projects. Those looking for enterprise-scale solutions or a simple hosting solution for a single, basic website would be better off elsewhere. Wondering how Nexcess stacks up against other Web Hosting companies? Enter any other Web Hosting company and we will give you a side-by-side comparison.